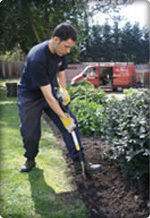 "I have found Rose Property Services to be one of our most diligent contractors in the Cleaning & Gardening sector. Whilst perfection is impossible to achieve, when an issue or problem does arise, they are quick to rectify it and most importantly, they then take steps to avoid it happening again"
Having been founded in 1987, we have over 20 years experience of building knowledge but more importantly via trial and error, learning from our mistakes which means we can provide an unparalleled level of service for cleaning, gardening and window cleaning. Also despite being tempted to expand occasionally, we have stuck to our core activities as listed above. This means we have consistently improved our quality of service in these specific fields rather than broadened them. As stated we have no sub-contractors, all of our team are in-house trained with methods that have proven to give the best results. This ensures that all of our team members are working in accordance to our fundamental policy of delivering a friendly customer orientated service. Alongside this we have a supervisory team that are regularly out observing and ensuring our high standards are being met. We dedicate 25% of our daily worksheets to “site feedback” which enables us to keep a very detailed record of the progress made with our contract cleaning, gardening and window cleaning services and report back issues found such as graffiti, dumping of waste or repairs. Finally, our unique experience and skills combined with the technology and methods we use mean that your property will look cared for all of the time and it will be achieved by a friendly team that you will be happy to have working on your property.